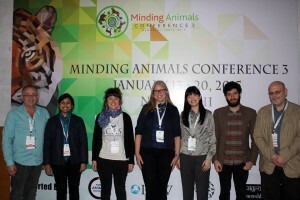 The mission of Minding Animals International is to advance animal studies worldwide. Every three years we partner with a like-minded organisation or a university to co-produce an international conference for scholars, advocates, policy makers, artists, veterinarians, and others. By ‘we’ I mean me, as volunteer Executive Director, and my colleague Rod Bennison, founder and chair of the board, as well as all the other directors. The first conference (‘MAC1’) was in Newcastle, Australia in 2009 and attracted 520 delegates from 23 countries. In 2012, MAC2 was produced in partnership with the Univeristy of Utrecht and was attended by 690 delegates from 42 countries. MAC3 was held in January and was hosted by the Wildlife Trust of India, in collaboration with Jawaharlal Nehru University (JNU) in New Delhi. It attracted more than 320 delegates from 35 countries. Discussions are already underway for MAC4 in 2018. Details will be announced later this year. The MAC3 six-day conference program reflected the trans-disciplinary nature of animal studies. The program included special events, plenaries, workshops, and plenty of opportunities to network. At the Pre-Conference Interfaith Programme and Multi-Faith Prayer Service at Baha’i House of Worship, Lotus Temple, representatives from the Hindu, Christian, Islam, Jain, and Baha’i faiths spoke about their respect for animals. It ended with me making some closing remarks. The irony! 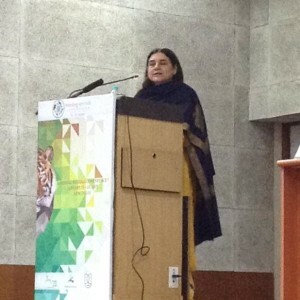 Keynote presentations were made by Government of India Ministers Maneka Gandhi, Minister of Women and Child Development and Shri Prakash Javadekar, Minister of Environment, Forest & Climate Change. I recall when we were at MAC2 in Utrecht, Vivek Menon, WTI’s Founder and CEO, said he wanted to host MAC3 because the will help to put animal studies on the map in India. Vivek’s dream maybe coming true as there was a discussion among the government minister’s of the possibility of federal government funding for an animal studies centre on the JNU campus. Clearly, this major development needs to be carefully monitored to ensure its fruition. The Young Scholars Panel at MAC3 book-ended between Rod Bennison and myself from left to right: Upasana Ganguly, Jessica Ison, Kelsi Nagy, Yuan-Chih Lung, and Adam See. One of MAC3’s unexpected successes was an impromptu presentation I had to organise as one of our plenary speakers, Mahesh Rangarajan, was unable to join us at the last minute. Following on from the previous day’s panel which I chaired that was organised by Ken Shapiro, my fellow co-founder of the Animals and Society Institute, which considered the state and future of animal studies and included Lori Gruen, Colin Salter, Joe Lancia, Donald Broom, and Sandra Swart, I commissioned a panel of young animal studies scholars. This panel consisted of Upasana Ganguly, Jessica Ison, Yuan-Chic Lung, Kelsi Nagy, and Adam See. Each one rose to the challenge with 24 hours notice to speak about how they understood animal studies and saw the challenges they face in the field. Rod and I feel strongly that at MAC4 we would like to invite these scholars back as a panel to assess how things have progressed (or not!). MAC3 was very successful. Among the many highlights was hearing speak for the first time the legendary Maneka Gandhi, who berated Indian governments for not doing enough for animals. It was encouraging to be told by delegates how much they valued the conference. Many spoke about making friends with others coming from different countries who share like-minded interests. I recall one delegate expressing delight at discovering a colleague from their university who was also interested in animal studies. This anecdote truly represents for me the strength and mission of Minding Animals International: to advance animal studies globally. MAC3 also gave me my first opportunity to visit India—a country I had always wanted to visit. But this was no time for sight-seeing, which had to wait to afterwards. The post-conference tour will be the focus of another post here. Dr. Siobhan O’Sullivan is Lecturer in Social Policy at the University of New South Wales (UNSW). 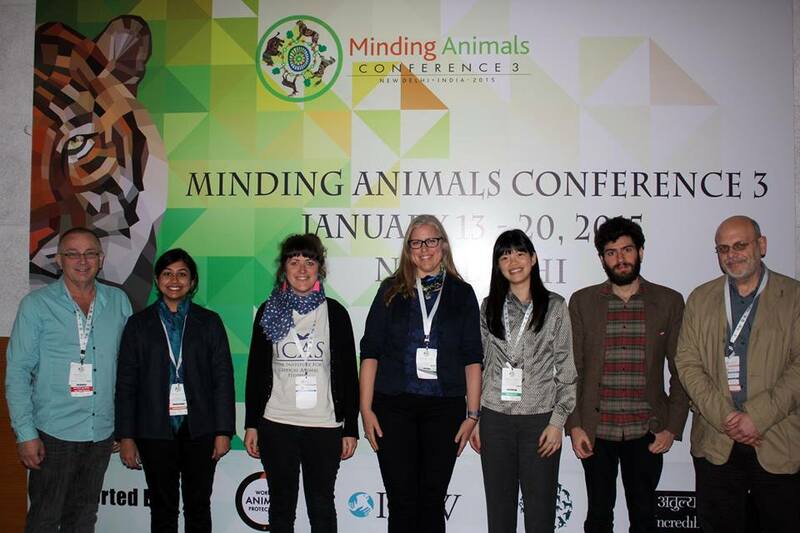 My animal studies year got off to the perfect start when I attending Minding Animals 3. Having attended the first conference (which was also the third Australasian Animal Studies Association conference in Newcastle, Australia) and then the second in Utrecht, it was my great pleasure to be at the third. Dr Fiona Probyn-Rapsey is a member of the Human Animal Research Network (HARN) at the Sydney Environment Institute and a senior lecturer at the University of Sydney. The conference covered six full days, each with 6 concurrent sessions, keynotes and invited talks. The papers were mostly social science/humanities oriented and the ones that were from the more science-y side were clearly committed to entering into interdisciplinary dialogue. To me, that represents a real maturing of the field – we’re getting more accustomed to having our work heard and discussed by those outside of our disciplinary homes. Please email with any others to share!